One of the things I miss about being in Corporate America was participating in Secret Santa Gift Exchanges. I was always in charge of coordinating the event because I am incredibly TypeA – or maybe the fact that I was trying to put up Christmas decorations as early as Halloween – and I learned a lot about how to keep it fun and organized – no matter how big of a crowd is participating. Secret Santa Gift Exchanges are a fun way to bring just a touch of the holidays into your workplace and strengthen friendships in and around the office. 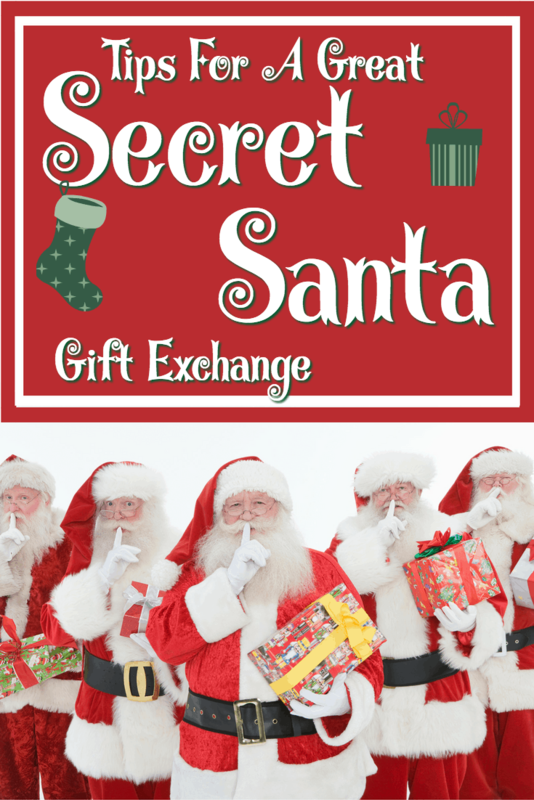 Here are some quick tips on how to keep your Secret Santa fun for everyone. Now is the time to start putting together your Secret Santa Gift Exchange. Things will only get busier as the holidays approach, so take a look at your calendar now to see when is the best time to run your event. You will need enough time for everyone to sign up, receive their person, shop, wrap, and deliver – secretly of course. Gathering participants in November for the event to start the beginning of December is a great time frame for a stress-free gift exchange. The two biggest rules are the deadline and the cost. Knowing that people many are chronic procrastinators, make sure you are clear on the deadline and have a way to send several reminders as the date approaches. You also want to set a firm cost that everyone can comfortably afford. Generally somewhere around the $25 mark is appropriate – you want the thought and gesture to be as special as the actual gift itself. Other rules may include whether alcohol or other adult themed gifts are appropriate or if you want a theme like Homemade Christmas Cookies. The worst part about Secret Santa Exchanges is not knowing what to get – or what you will receive. There is nothing worse than that uncomfortable silence when you unwrap something thinking “what in the world…” as you try to stammer out something that sounds like a genuine thank you. Jill at Create.Craft.Love has a beautiful Printable Secret Santa Survey that you can use to help you choose the perfect gift! You could even use them as the slip for sign-ups. Oh, how I wish this was available back in my coordinating days. Elfster has made organizing and execting a Secret Santa Exchange a piece of cake! Elfster is a free online Secret Santa organizer and social networking platform for gift-giving. With over 5.5 million users, Elfster has become one of the most used online gift giving resources and Secret Santa generators for the Holiday Season. You simply sign up, send the link to all of your participants, and Elfster does the rest! They even have universal wish lists and an updated Shop section so you can shop right from their site to have the gifts delivered! How easy is that!? No Gift Exchange is complete without someone forgetting something – so have an extra gift or two wrapped and ready to go if needed so there are no hurt feelings. Gift Exchanges are not life or death so try to go with the flow if someone flakes out, and not get too terribly upset about it. If you get lucky and everyone remembers – decide together who to gift the extra gift to as a group and brighten their day. Consider people like your mail carrier, maintenance tech, or other people who make your job easier. No matter what – remember that Secret Santa Gift Exchanges are meant to be light and fun and full of holiday cheer. Even if you receive a gift you are not fond of, remember that someone went out of their way to find and purchase the gift, so be thankful no matter what. Thanks for the great tips! I had never heard of Elfster- I will be using that next time I have to organize one!